Robert Ballard (born Wichita, Kansas, 1942) is an oceanographer and explorer. 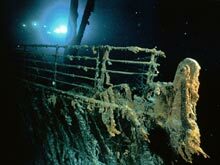 He found and investigated the remains of the Titanic. Children could read an interview of him at: Robert Ballard. David McPhail (born Newburyport, Massachusetts, 1940) has written and/or illustrated close to 200 books for children. His works include Mole Music and The Family Tree. Children could visit his website at: David McPhail. Elizabeth Kortright Monroe (born New York, New York, 1768; died Oak Hill, Virginia, September 23, 1830) was the wife of James Monroe, the fifth president of the United States. She was the daughter of a British soldier who decided to stay in America after the Revolutionary War. Since she and her husband had traveled so much during his career, she tried to model White House functions after those of Europe. Children can visit a website at: Elizabeth Monroe. Idea: Children might see if they can find out information on the fashions of her time. Did they dress fancily? Did they have extensive wardrobes?